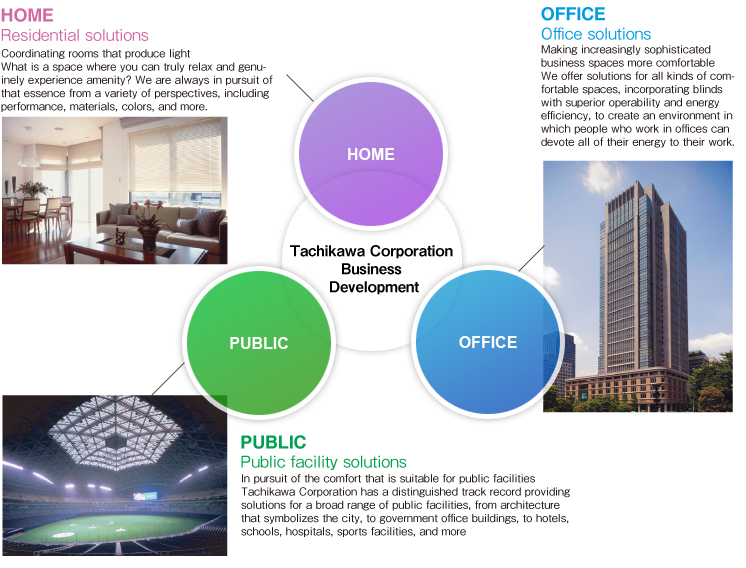 BUSINESS OUTLINE　TACHIKAWA CORPORATION / TACHIKAWA TRADING CO., LTD.
Tachikawa Corporation is a leading provider of window covering products, centered around blinds and room partitions. Since its inception in 1938, the company has been dedicated to developing products that earn the satisfaction and deep trust of the customer in creating a more comfortable living space for them. Boasting more than forty years since their release, Silky interior blinds are the pioneer residential blinds in Japan. Our product line is not limited to residential items, we also develop products to meet the needs of offices and public facilities, and we strive to offer solutions dedicated to creating a comfortable environment by producing a broad range of window coverings. Delivering the best items to live each to his own. Tachikawa Corporation draws on a wealth of technology and expertise cultivated over seventy years in meeting all kinds of needs of window interior decoration with a broad range of items. In order to meet the needs of customers precisely, we manage various types of products consistently?from development to construction. We offer a wide variety of colors and operation procedures, which create a truly multiproduct line. Nearly all of these are order made in 1 cm units to fit the width of the window, and the system is designed to have the product delivered to the customer within about two days after the order is placed(domestic only). In order to meet the needs of the customer and create a comfortable environment, we implement this system using a nationwide community-based network with a consistent cycle from development to sales, production, and construction. As a result, we are able to respond effectively to the voice of the market and to the ongoing needs of our customers. By doing each business process in-house we are able to cast the customer’s voice into shape directly. We implement ISO9001, the international standard of quality control, in all departments?development, production, sales, and processing?and of course the information we gather from customers is vital to business operations while making every efforts to reduce claims. Our company is in a category that has a low environmental impact to begin with, but in order to meet social demands to further reduce our environmental impact, we implemented environmental ISO standards in our manufacturing department and achieved zero emissions, while at the same time reducing the waste of construction materials.